In this episode Teah, Jay, Faiq and Dibah discuss washing machines and how technology is perceived in Brunei. Dibah also relates her frustrations of finding the ‘right washing machine’. Teah, Faiq and Jay take you all onboard the relation-SHIP as they navigate the high seas searching for a partner for Teah. Faiq, Jay and Teah discuss about the process of traveling from seating arrangements to War on Terrorism to being Zen. We also offer cheat sheets in flights! The first episode for Let’s Nasi Katalk. We talk about London Olympics, Bruneian athletes, and potential sports Bruneians will win gold at. 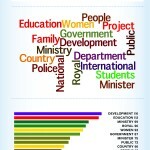 [Infographic] Frequently Used Words in The Brunei Times from 11th-18th April 2012.
bruakal – Facts about Brunei, once a week!